The town of Amecameca mexiquense is located in the foothills of the Sierra Nevada, within the province of the volcanic axis and in the basin of Moctezuma-Panuco River. amazing snowy landscapes, enjoy every step its architecture and feel the energy given off two impressive volcanoes, is an experience you should not miss. The word Amecameca, originally Amaquemecan, comes from the Nahuatl or Aztec language. Its roots are amatl words, which means paper; burn, meaning and can point, to indicate which translates as place. Therefore, Amaquemecan means "the place where the papers say or indicate". Amecameca 2010 was included in the House of Peoples Bicentennial program, which celebrates the revaluation of attributes, recovery of landscapes, the rescue of the history, culture and mexicanidad. It is located 57 kilometers southwest of Mexico City, on the eastern portion of the state, Mexico. 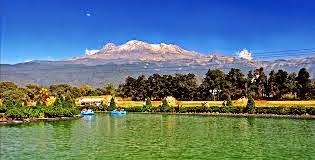 Located at the foot of the Popocatepetl and Iztaccihuatl volcanoes, this town was in ancient times an important ceremonial center of the indigenous world, and during the colonial period favored retreat of Fray Martin de Valencia, who led the first Franciscan evangelization of New Spain in 1524. Since its inception it was a very interesting place, its proximity to Mexico City, his outstanding political centers, its importance as passing travelers and trade him back important. Amecameca experienced significant industrial development during colonization, when installed, cotton factories, breweries, potteries, mills, sawmills, saddlery workshops, as well as sites to produce coins of gold, silver and copper. With a Dominican style, was built between 1554-1562. On the façade you can see the sculpture of the Virgin of the Assumption, at his feet surrounded by faces of angels. On the ledge of the window, highlight your decor in drops. Once inside the temple, you'll meet a neoclassical altarpiece, with the image of the Virgin of Guadalupe and while in one of its walls is another Baroque altarpiece with biblical images that surround a classic spiral columns. In the sanctuary of this temple, there are two baroque works with similar characteristics to the above, while there is another which refers to a Christ cane. On one side of this church, the cloister is located with beautiful arches on two levels, where the arches are carved in stone and stylized floral decoration on the capitals of the columns. Definitely a place full of history, which also is home to the Museum Sor Juana Ines de la Cruz. Even you can see the rooms, garden and chapel of what was once one of the most important properties of the region. The place keeps an interesting collection of oil paintings and real estate at the time. Panoaya offers visitors a variety of entertainment and attractions in the vast forest that have been conditioned to conduct ecotourism activities; also has a nursery and dedicated to Christmas tree plantation area. The property has a large area that accommodates a zoo with over 200 animals, such as ostriches, llamas, deer, deer, goats, ducks, among others. Among the activities you'll find on this site, is the country's largest zip line, with a length of 200 meters long. And for those looking for tranquility, wetland and lake that exist here are ripe to let time pass to board a boat instead. On top of the hill is this temple, which was built on the remains of what at one time were the indigenous amoxcallis teocallis. The Sanctuary was used during the conquest, as a school for evangelizing the inhabitants of ancient Amequemecan. Today, it is one of the most important churches of the state of Mexico. Inside is the image of a Christ made ​​with corn stalk paste and an urn in the main altar lies the image of the Lord of Sacromonte. From this point, you can get a magnificent panoramic view of the whole town and surrounding area, including two impressive volcanoes. It is one of the busiest places on weekends, when visitors take the opportunity to rest in their handmade benches, as they are made ​​by locals. At the center of this site kiosk classic style of the 50s, where you'll find at the bottom, two small shops that offer the best sweets in the region rises. Another important point about this place is the basket ball game dating according to historians, the year 1299, when this activity was of great importance in prehispanic cultures. The name of the Garden is due to the four sculptures of lions guarding it. It is a protected nature reserve, covering two major volcanoes of Mexico Iztaccihuatl and Popocatepetl, located in the Sierra Nevada. The reserve covers more than 45 hectares, covered by alpine forests, waterfalls, canyons and gorges. For those adventurers who like hiking and climbing, you should first obtain a permit from the park headquarters, due to the continuing volcanic activity recorded in the area. The park entrance fee is 20 pesos per person and if you intend to stay in the hostel Altzomoni, should cover another fee of 20 pesos. This park offices are located in the Plaza de la Constitution 9 Ground Floor, in downtown Amecameca, for those who want to know about access, activities and routes.